After skipping the first 2 races in the Division, we got antsy again and decided to drag the Wage out of the trailer and see if it still ran. COLD and WET generally describe this event but this weekend was one of the better ones. The tow was uneventful and we reached the track Thursday night - planning to do some testing on Friday. We purchased a disc brake conversion kit for the front of the Vee and wanted to test it to see how it worked. Front brake and suspension parts are getting harder to come by, so I wanted to see what options might be available. Crew Chief Jerry made the drive down out of the Ohio snow to help us get back in the swing of things. Test day dawned COLD (high 30's) and dreary - but not actually wet. The overcast hung with us all day, but only a few drizzles bothered an otherwise pretty decent test day - it actually got up near 60. Briefly - we ran 4 sessions during the day and had no particular problems with the disc brake set up - it worked quite well. I have recommended to others that we allow the use of this kit in the future. Time will tell whether the rules get changed to allow it. In the afternoon, Jerry and I converted the car back to the standard drum brakes - only about an hour's job before breaking for some of Linda's (and Jerry's) chili. We hoped for clearing overnight. Our qualifier turned out pretty wet - and miserable cold (low 40's). I agonized whether to go out or not. Jerry and I went and watched the cars in the previous session as they went around. The rain came/went and came/went several times. We finally decided to go out on the intermediate tires. The track didn't really look wet enough for the full rains. After getting out there, I remembered the last time I did that - Summit Point at ~40 degrees - and I had the same problem. Although it wasn't really wet enough for full rain tires, the cold temps kept the intermediates from getting any heat or grip. The full rains would have definitely been better! As it turned out, I JUST managed to squeak out the pole time - by about 0.1 second over Dale Rader visiting the "sunny" south from Pennsylvania again. We gave the car another look over, wrapped things up, put it into the trailer for the night and went over to the worker social to consume some adult beverages and eat some treats. Race day was GLORIOUS! Cold but sunny. Since we were the LAST SCCA group of the day, we got to watch a lot of racing. A bit windy so it felt colder than it really was, but by race time it was in the low 50's. We had a really mixed grid due to the rainy qualifying. 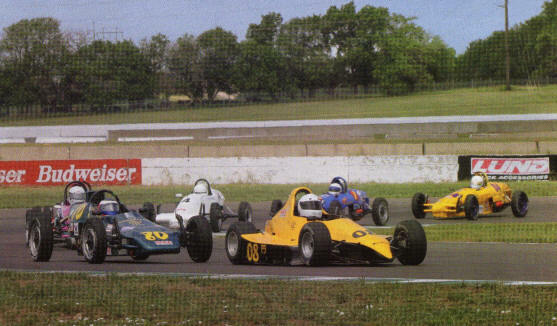 Dale and I had both outqualified 2 Formula Fords as well as a Formula 500 - the start was going to be 'dicey' - we both knew those 3 cars would easily beat us into the first turn - the problem was how to safely manage to let them by while not letting any Vees by and still not crash any one. I watched my mirrors more than the front as the green flag waved - one Ford went right, one left and at the last minute the F500 came screaming by just before the 1st turn. I tried to think SMALL as we went through the turn and only a couple of cars had contact - none seriously, and none was ME <g>. We all headed off for T2 with the Fords and 500's quickly pulling away. As I got to T3 I could see one of the Fords up front spin at the exit of T4 - everyone started slamming brakes and diving every which way. Several cars had significant contact there as I dove to the inside and snuck by in the clear. I think some of the Vees got tangled up a bit as I had a pretty good lead going down the back straight. I could see the 2nd place Vee in my mirrors, but I put together some good laps and watched him get smaller in the mirror until he was gone (actually, I think something broke on his car). Linda was giving me splits over the radio and after about 5 laps, I settled down to a reasonably safe pace. With the rest of the field fighting for position, I was still increasing my lead - even with the reduced pace. Fortunately, everything held together and we held our lead until the checker flew. 12 points in the books and time to think about the next race - we'll probably skip Roebling in favor of making the trip to Summit Point :-). Well - Linda did it! She talked me into going to the March Roebling and probably skipping the July race instead (when it's SOOOO HOT!!). The tow was uneventful and we set up camp and watched some testing on Friday. It was a beautiful weekend - mid 50s or so at night (perfect sleeping weather) and mid 80s in the day - a little warm, but not uncomfortable. I had also done some MORE modification to my cooling scoops for the heads hoping to lower the head temperatures more. We went out for the first (practice) session on the same junk tires we used at the Road Atlanta test day last week (no report on that since I didn't race). Car seemed pretty good on the first lap, but the shifter was balky - the transmission had acted up on me during the test day, but I thought it was trash in the shifting mechanism. On the second lap, it almost wouldn't shift - on the 3rd lap, it WOULDN'T shift - rats!! Guess I was wrong about the gearbox. Fortunately, Linda had insisted that I bring along my long box (**short box (broken one) = less top speed for given RPM - **long box = higher top speed, only used at Daytona in recent years) as a spare - just in case. Seemed like a reasonable idea, even though I was sure I wasn't going to need it ... but I did :-). I now know how long it takes to swap the transmission - about 3 hours. Swapped it out and had 30 minutes to spare before the afternoon qualifier. It was pretty warm by now and I decided I needed to put on a little bit better set of tires. Took the old ones down to Goodyear and had them swapped for some BRAND NEW stuff for the race. The session started and the car handled terribly. I tried to adjust it with my cockpit adjustment, but it just wouldn't adjust - adjuster seemed broken - mental note to check that out at the end of the session. The car was sideways in every turn - almost uncontrollable. On about the 4th lap, a F500 spun and got collected in a big T-Bone crash in T2 by a Vee. They black flagged the session and we waited in the pits while they got the F5 driver out and sent him off to the hospital (more on that later). While we were waiting, I decided to hop out and see if I could adjust the rear suspension a bit by hand - I did move it some, but not enough to help. When we went back out, the car was just as bad as before so I just took another couple of laps to think about other things on the car and then came in to weigh on the scales. Came up at 1030 - 5 pounds to spare - sounds about right :-). Amazingly, when the grid sheets came out, I was still on the pole. The other cars weren't handling any better than I was <g>. I did some studying on the setup for the long box now in the car and decided that I needed to make some pretty serious changes to my camber limiter - got that done, then fixed the remote cable adjuster, checked over a bunch of other things and started UNmodifying my head scoops - I built some "adjustable" openings and it wasn't working as well as I had hoped. Then we packed up for the night and went to the social. Sunday morning was cool and nice. I went out for 3 laps in the morning warm-up to scrub in my new tires - I don't like to start a race on new tires - too many things can go wrong (like one leaks air, is out of balance, etc). The session was great and the car was fast - almost a second faster than the qualifier and I was being careful to NOT slide the tires. The handling was good - the changes I had made were the correct ones - the cooling seemed better. We started the race on the FV pole, but that put us on the outside of about row 6 with the FFs and F5s in front of us. When the green waved, I was a tad late on the gas and New Yorker, Dave Green got on the inside of me going up to T1. With the long box, I didn't 'spool up' quite as fast and couldn't hold him off - we started into the turn side by side, but I thought better of staying on the outside and let him slide up in front of me just past the apex of the turn. I followed him until we came out on the front straight again and set up a nice late pass. I watched and saw that Steven Schiff was coming with me so we both passed Dave going into T1. My job at this point was to make NO mistakes and put together a really good lap while my tires were still at their best. This would be the best time to break the draft. I was watching my mirrors again as I came up onto the front straight - Steven was a good bit further back than he had been when we went into T1 - looked like a 'maybe'. I kept my foot in it as hard as I could and scrunched down in the car (less wind resistance <G>). I made it to T1 with several car lengths to spare and felt like "all" I had to do at this point was to drive my lines and - as always - make no mistakes. Linda gave me splits as we counted off the laps. The gap got bigger with every lap, so after 3 pretty hard laps, I backed off to save as much of my tires as possible. I tried to make all my turns such that the tires didn't slide at all. The FF cars came through as I went a lap down to them - then the F5s. Laps keep counting - I concentrate on conserving tires - no scrubbing, but still decently fast. The FF cars lap me again and there's only a couple of laps to go. Linda has quit giving me splits now, but I can see the 2nd place Vee on the front straight headed for T1 as I come out of T2 - that's a pretty decent gap :-). The checker waves and we carve another notch for the ole Racer's Wage. Pole, fastest lap, and the win - and we weren't even disqualified for being too light on the scales <G>. A very nice looking trophy and a Winner's sticker for the car. Head scoops still aren't what I want - but at least I have more info to work with for the next event. As I was coming off the scales, someone mentioned that the F5 driver had come back to get his stuff. A group of us had put what was left of his car on his trailer and packed up as much of his stuff as we could on Sat evening. I went over and found him driving his van - no broken bones (maybe a cracked rib, but no fix for that anyway - except time). He was banged up but feeling "OK", though he will probably be even more sore tomorrow. Nice to hear that he was OK - though the car didn't fare so well. Road A turned out with a great entry crowd and some decent weather for a change. Atlanta weather has not been characteristically good to SCCA in the past. Although a bit chilly, the lack of wet stuff led to some really outstanding racing in most classes. We got the repaired gearbox installed to make sure it was OK before heading off to Summit. Being the genius that I am, I decided to exercise some brilliance and redesign my shifter somewhat to "improve" it. Well, THAT turned out to be pretty much a disaster. Although it seemed to work respectably well in the garage, trying to get 3rd gear reliably at speed under heavy braking left a LOT to be desired - I have JUST finished returning it to it's previous operational configuration :-). The weekend started out pretty good. I got involved in our online registration program and worked at Registration on Friday night to see how things went. All in all - pretty good - we processed about 150+ drivers/crew and guests in just a tad over an hour. Been a long time since things went that smoothly and quickly. Saturday morning was gray and chilly, but not wet. Our session time arrived and I took the car onto the cold track. It was quite windy and the car danced around a lot more than I expected. We went 'a bit' slower than I expected too, but traffic was not good to me and I just tried to be careful and not spin and hit anything. I saw several spins from others and felt that a practice session should not turn in to a crash session. My shifter was balky, but getting the job done - the trannie seemed OK. The session was nearing its end when I finally came across visiting Vee specialist Paul McClorey just in front of me and prime for a good draft. I came out of T7 onto the back straight in good position and was closing like GANGBUSTERS on him. I was going to go around him like he was tied to a STUMP !! I popped out of the draft and almost instantly the motor seemed to drop a cylinder - I don't think I ever even got along side of him before I started dropping back. I got out of the throttle and listened - no terrible raspy noises - just a 'different' sound. Gauges, pressures, temps were all fine. Hmmmm. I suppose I could have left a spark plug loose or .... maybe ... yeah! maybe I broke a rocker arm. Been a while since that happened to me, but there was a time when I broke several in a single year. Back in the pits, a quick check confirmed no spark plug problems, so off with the valve covers - first one off and it was obvious. I was right - broken rocker arm on #2 cylinder. (That drops about 25% of the horsepower off - doesn't leave much to race with <G>). I checked around in the trailer - normally I would just go to my backup motor and pull one from there - but Rollin has it at the moment. Took a while, but I finally managed to locate a couple of spares. I had to lighten and 'balance' one using a hand grinder, but it was doable and I completed the job in about an hour. Put it back in the motor, fired it up and all seemed well again. Plenty of time before the next session. Next session was a qualifier - I left the 'not so good' tires from practice on the car. I'm trying to be frugal and need to use ALL of the rubber when I can :-). The session seemed slow. Linda gave me my times and they sucked. About half way through, she told me that Jeremy had the fast time - about a second and a half faster than I was going. The car seemed 'odd' - I couldn't quite put it where I wanted to. Steering seemed spongy and I noticed going down the straight that it had more free play than it should have. I told myself to quit overdriving -concentrate on the task at hand - put together some consistent driving and be SMOOTH. I worked at it, but it still seemed more difficult than it should be. Finally on the last lap, I got a decent run into T1 - not great, but OK - then I saw a draftable car up in front of me - if I could get to him and get a draft down the back straight I stood a chance of getting decent lap in after all. I closed faster than I expected and was a bit disappointed that he wasn't further ahead coming out of T7 - but I had what I had .... I stayed in the draft just as long as I could, popped out (and was pleased that the engine continued to run this time <g>) and around. MAKE SURE you don't screw up T10A/B this time - it'll kill the lap. I made it through OK and came out under the bridge to see the checkered flag waving the end of the session. Coming under the start stand, Linda announced that I had JUST taken the pole in FV - by over 1/2 second!! HEY - I'll take luck any time <G>. The shifter was still balky, but I felt that I could come to grips with it pretty soon. Back in the pits, veteran Vee pilot (from the olden days) Gordon Webster was visiting and helping me look over the car. He was giving me a hard time about inconsistency in hitting the apexes - I agreed completely. I commented on the looseness of the steering and we both looked at it. Something didn't seem quite right! I pulled the bodywork off and we studied it more. The pitman arm was moving too much in the vertical plane. Closer inspection showed the complete steering shaft was moving. I took the wraps off the steering box and found the bolts loose on the cover (AGAIN!). I tightened them back up (with LOCKTITE this time) and MAN - did it ever make a difference. It seemed pretty obvious why I was having trouble making the car go where I wanted. I looked at the tires I had available and decided that I needed at least new rears for the race. I had only the second qualifier to go before the race and didn't want to start the race on sticker (unscrubbed) tires - so I traded the 'rags' off for a couple new rears and made myself promise not to go too many laps on them in the qualifier. I dug up some 'better' front tires so the car wouldn't be unbalanced and we waited for the next session. At around 7 minutes before our session, I got into the car, buckled myself all in and cranked ... and cranked ... and cranked - NOTHING. It had cranked several times minutes before with NO trouble! What was the problem? I nearly ran down the battery before giving up... jumped out, took my helmet off and started taking off the bodywork - I really needed to get out for at least a lap or 2 to scrub the tires. I checked for spark plug fire and none. I made a stab in the dark guess that possibly something had gotten in the points - about the only thing I could fix in a minute or 2 anyway. I drug a clean card through the points gap and reassembled the distributor cap and LO - it fired up. BACK on with the body work, back into my helmet, back into the car and off we went. Lost about 2 laps but we were on the track. With the fixed steering and new rear tires, the car felt GREAT! I concentrated on my lines and worked on getting speed into T1 and up the hill. I felt tons faster in all the turns, but the times didn't show it. I was able to turn about the same time without a draft as did in the first session with a draft though - a good sign. I came on in and saved the tires. Shifter still not to my liking, but I'm getting better with it. Race time on Sunday. The weather was GREAT! Sunny skies and mild temps - around 70 or so. At race start, Jeremy got the jump on me (as usual -I think he has jato paks hidden somewhere) - he led into T1 and I tucked in behind and followed. I stayed close and drafted by at the end of the back straight. I tried to put together one of those 'really good laps' and get away, but this time, he was having none of it. He stayed plenty close enough to draft back by. I led for the next 3 or 4 laps and then he went by me again. I considered the odds and decided I'd stay where I was and just see if I could hound him into a mistake. I did, but it wasn't' big enough to capitalize on - but close - I thought he wasn't going to make it through T1, but somehow he saved it and kept the lead :-). A little over half way through, I could see some traffic ahead - in addition, Linda was telling me over the radio that the Fords and 500s were closing in and would be catching us soon. Traffic is an easy place to get separated and I decided that if we DID get separated, I wanted to be in FRONT - so I drafted by and took the lead again. We caught traffic and traffic caught us and nothing I did seemed to shake Jeremy off - he stayed right there. RATS - that means *HE* is now in the catbird's seat with the last lap pass opportunity. I have to figure out what to do about that .... I'm pondering .. and pondering ... Linda gives me "3 laps to go" ... pondering. Then - going down the back straight, Jeremy passes me !? HEY - I'll take that! I tucked in behind him and waited till the last lap - he 'played' a bit - I 'played' a bit back - but in the end, I HAD him - I completed the last lap pass, fought off his repass threat under braking and held the lead coming into T10A - as I exited T10B, the front just seemed to SLIDE! Was there oil? Did I have a flat? Can't look now - concentrate - keep position. Jeremy is CLOSE - going into T12 I can see him, but I can hold him off easily - then, the front SLIDES again!! I'm headed for the grass under the flag stand - I grab all the wheel I can without spinning and JUST manage to hold off the charging Jeremy (and even stayed mostly on the track)!! NICE RACE!! for both of us. I still don't know why the car slid in those last 2 turns - can only assume that there really was some oil there in the line - Jeremy, being slightly off line (looking around me) didn't feel it. He didn't know what the lap count was and so passed me too early. Thanks to Linda, I DID know - I'll take all the advantages that I can, thank you very much !! Thanks also to Gordon for dropping by to give me some pointers and watch my driving with a critical eye - I can always use that kind of help! During the race, I missed the downshift to 3rd gear and nearly wrecked about 4 times. THEREFORE, I finally decided to drop my new shifter and go back to the old one - just don't need that kind of problem in the heat of battle. Fix up a few minor things, pick up my other motor - install it and then we're off to Summit Point. I'll be visiting with a couple of my cousins up that way - one who's going to drive 6 hours to watch us race. I hope we can make the trip worthwhile for him :-). 3 races - 3 wins - 36 points and we're leading the Division - Jeremy is second. Could be an interesting season. Linda is telling me that my reports are too long - on the other hand most comments I get are "Details - we want DETAILS!" - so I'll try to compromise here :-). First, the non racing stuff. Before we got out of Atlanta good, we had the CLOSEST encounter with a liquid (of some sort) truck and something else. Traffic was slowing near the GA Mall and I was keeping a big gap. Suddenly the tanker truck pulled over in front of me (shortening my stopping distance by about 60 feet) and then stopped short. I slammed on the brakes, felt the motorhome tires lock up, but the trailer was still pushing us. As the gap closed down, I realized that we probably weren't going to make it - I had cars on my left and cars on my right. I started fudging left a little, trying to modulate the brake and get us stopped. At the last second, I KNEW we couldn't make it so swerved left as little as I could to miss the truck - willing at that point to accept a side to side with whatever was there (and miserating about how long we'd be there filling out paperwork). Fortunately, the small truck on my left was already giving a little room since I had fudged into his lane, and when I swerved, he did too - I don't really know how close I came to him, but I can tell you I was pretty sure that I was missing some paint off both sides of the motorhome! Neither Linda nor I can believe that we didn't hit anything - we were VERY lucky! After that, I turned the trailer brakes back on - I had forgotten to reactivate them when we pulled out of the driveway (I have to turn them off to meander through the woods to our home parking spot). WHEW!!! Cousin Jeff and his wife Nancy drove down from New Joisey to watch and another cousin Diane, her husband, Charlie (and dog Dinah) drove over from their home 15 miles away. Crew Chief Jerry also drove over from Ohio to help us out. It was nice to have a 'fan club' at the track with us - good to visit with family too :-). Friday weather was great! - low 70's and clear, but overnight the temp fell and it started raining and just wouldn't quit. Both qualifying sessions were wet and we SUCKED in the rain. We're usually pretty good in the wet, but I just couldn't make it work for some reason. In the first session, the car started out feeling good, then we had a bad case of carburetor icing - the car got slower and slower and when I finally came in, it would barely run above idle. It quit as I got back to my paddock spot. By the time I could get it apart, all of the ice was gone, but I did verify icing by looking into the carb and WATCHING ice form as it ran. We dug out Jerry's 'Vortex Generator' from TWS 3 years ago and installed it for the second qualifier. The engine ran decently the full session, but we still couldn't get any speed. I couldn't understand - I seemed to be getting pulled out of all the slow corners. The tires were sliding all over the place and I decided that my rain tires must just be too old (about 5 years). At the end of the session, we were 6th fastest (5th in Vee) - in the upper end of the field, but not where I'd hoped to be. :-(. We looked everything over, found nothing - I compared my tires to those of Ed Womer beside me and just really couldn't see a noticeable difference ('cept he was 3 seconds faster than me). I considered changing the engine, but decided it was probably just tires, so we packed it in and the extended family went out to a great chicken & rib dinner at Buffalo Wild Wings! Race day dawned clear and cold - temp now down into the 30's. I skipped the morning warm-up - then regretted it since I hadn't been on the dry track in 3 years. Lots of time to think about that while we waited for race time. Jerry and I discussed changing the engine again - but checked it over and again decided it was probably OK. (I might have known better had I run the warm-up). At race time, the temp was up to low 50's or so, but the track was dry and conditions were good - as long as you stayed on the paved parts. At the green, we got a pretty good start - passed one car and stayed close with the front guys - I was on the outside and there was a 'passle' of cars on the inside at the braking point for T1. I thought briefly about going around the outside, decided against it - but too late - Ed moved left a tad setting up for the corner and tagged my right front with his left rear (not his fault - I shouldn't have been where I was) - I dropped a tire into the wet grass on the left and slid STRAIGHT toward the GRAVEL TRAP - EGAD!! I played with the brakes and steering and TRIED to get speed off the car. I went JUST into the edge of the trap, but managed to get JUST enough angle before hitting it to point myself out. I eased the car across it and into the mud beyond, trying make sure I didn't get stuck and didn't spin. I got through it all and back on the track - DEAD LAST by several seconds. I noted that my left side tires were coated with mud and tried to sling as much of it off as possible before I got to T3. Carefully through 3, then on to 4 and 5 as the tires cleared up. I set my sights on the car ahead and decided we'd just have to play catch-up - that can be fun some times. At least we were still on the track and not stuck somewhere :-). I put my foot in it and started picking off cars - slowly. I was surprised at just how FAST these cars were. I qualified several seconds faster than they, but they were JUST as fast as I on the straights and they seemed to be pulling me (again) off the slow (and now fast) corners. I didn't understand it. I was used to being able to blow by SOME people - but not today. The slow guys up here must be MUCH faster than our slow guys down south. On the trip back, Linda and I discussed the race. I commented on how surprised I was at the good engines of those guys at the back. I was used to being able to pass without too much issue - at least if I did it right. She said - "maybe there's something wrong with the engine" - I said - "nawww - we checked everything didn't we?" She said "what about a broken head stud?" (Linda has become quite the FV mechanic <G>) ..... ..... ..... I paused .... .... hmmmm. If a bottom stud breaks, it's always obvious because he head starts leaking oil everywhere - however, if a TOP one breaks ?..... When we got home, I immediately went to the trailer, took off the head cooling scoops and checked - SURE ENOUGH!!! the top stud on #3 cylinder was broken!! Pretty good news actually. Now my 5th place finish looks even better - and it explains why I had so much trouble passing - and why I was getting pulled out of the corners (broken stud ~= 5 - 15% down on power). I'm a little aggravated that we never bothered to check for that before the race, but the wet just screened off the issue too much. I'm pretty sure it broke about 2 or 3 laps into the first session. When I FIRST went out, power seemed fine, but then the carb started icing and I blamed that for everything. Road Atlanta was surprising in that we had the best weather I've seen at the track in several years. Beautiful sunshiny days and mild comfortable nights - NO RAIN!! Not much to tell - the car ran fine all weekend. Jerry came down to crew and luckily, we had a leaking axle boot that he got to fix for me <G>. My times were a bit slower than I would have liked (aren't they always? ), but I was unable to come up with any real explanation as to why. I didn't put "good" tires on, but the car seemed to be handling great. I spent the entire 2nd qualifying session working primarily on Turn 1. It's interesting ... by just concentrating and working with my line, I was able to drop my laptimes a FULL SECOND (still not fast enough to suit me, though). I guess that just means that I was a bit lax to start with - but I FELT like I was trying... and going fast - but the clock said differently. I studied my mph and rpm data to see if I could see any problems, but it just seemed that everything was "just a bit off" - nothing concrete. On the good side, we were still fast enough to win the pole and the race. I took the lead at the beginning and seemed to have a handle on things. However, after Mike's (the crash above) day ended, Stephen Schiff started to close on me and I had to double my efforts to keep him at bay. When the DSR guys started coming through us, HE was the 'put off' guy mentioned above and that ended his threat to win. I cruised from there to a relatively easy win - except, of course, for the constant threat of DSR'itus. I just changed the motor (time to freshen the old one) and worked on the brakes some - then loaded the car. We leave in a few hours for Kansas - we'll follow the yellow brick road and hope it ends up somewhere nice <VBG>. OK - we're BACK! The tow was long, but uneventful 'cept that it was HOT HOT during the trip up and the A/C in the MH didn't seem to be working very well. After sweltering for several hours with temps outside hovering around 99, I finally stopped at a Walmart and picked up a recharge kit - thankfully, it worked and we were comfortable after that. Jerry was planning to travel with us, but had to go back to Mansfield for a couple of days - then drove on over and met us at the track. Linda and I got there Thursday evening, but the track wouldn't let us in - we slept outside until registration opened Friday morn. We got in, spent a while arguing with the track personnel about where we could park (everyone gave a different answer), but we finally got a pretty decent spot next to the false grid. Since we had decided not to run the test day, I spent the rest of the day watching the testing, figuring out where the track was and which direction it went, and unloading and doing a final check over of the car. Saturday morning was mostly clear and getting hot quickly. Since I hadn't tested, I needed to come up to speed as quickly as possible - THAT'S when the trouble started :-(. I had managed to get a lap around the track during the previous day's lunch in a rental car (thanks to Steve Oseth), so had a general feel for how to get around - apparently not quite ENOUGH feel tho'. On my second trip through T14 onto the front straight, I missed the turn-in badly - got out of it immediately, recovered, lost it again, recovered, lost it again and was trying to squeak down the concrete wall when WHAM!!! I smacked it. Probably only had about 10 MPH into the wall and, maybe 25 MPH along it, but it was enough to tear up a BUNCH of stuff! I was not hurt, but with the right front wheel dangling, was somewhat stuck - nevertheless, I didn't like sitting in the primary impact zone (I just proved that! ), so I shoved it into reverse and backed along the wall trying to get out of harm's way. As I backed using my mirrors, I could see FLAMES coming from the rear, but I was moving so I kept going until I passed the corner worker with the fire bottle - THAT seemed like a good place to stop :-). He dumped some Purple K on the headers and the fire was immediately out, but it sure left a mess. Fortunately, there was no real damage from the fire - oil was everywhere from a broken oil pressure sending unit due to the impact. The wrecker drug me back to my paddock spot as I pondered the ingeniousness of skipping the test day due to co$t, and then smacking the wall trying to make up for the lack of the test day and it costing considerably MORE than the test day would have - not to mention the hours of work! We set about the task of measuring the damage while cleaning up the worst of the Purple K (Fire Extinguisher insides) - that stuff REALLY is messy when it hits hot exhaust! The worst of it appeared to be the rear transmission, but fortunately, that was found to be OK with "just" a broken rear hub and wheel taking the hit. On to the front - damage didn't appear to be too bad until Jerry noticed that the beam was bent. I pondered racing with it bent, but decided that I did have the parts to fix it and I might as well do it NOW, rather than race in an "inferior" manner and still have to fix it later. Paddock mate, Eddie Cadena and his wife Lynn, pitched in and helped where they could - MAN, WAS IT HOT!! Boiling sun - even under the awning it was HOT - but we soldiered on. We had about 4 hours before the afternoon qualifier and I really needed to make that. Needless to say, THIS time I was a LOT more careful with that last turn onto the front straight - we didn't crash, and I worked the laps - with each being faster than the previous (the way it's SUPPOSED to work) and I'm starting to connect the turns together - the car is working great. Amazingly, at the end of the session - we are gridded THIRD only 3 tenths of a second off the pole!! (after a total of only 9 1/2 laps on the track!) Back to the paddock to find that Eddie never got his car started and missed the whole session (the only qualifier) so he'll have to start from the back in the race. We all worked on Eddie's car till we got it running again and then we went to the social where they dedicated the new pavilion to the memory of Scott Liebler (former FV pilot and friend) before retiring to the air conditioning in the motorhome. Sunday warmup was quick - I only took 2 laps - just to scrub in new tires and make sure everything felt OK - it did - and Eddie's car ran fine too :-). It was overcast most of the morning, but still pretty hot at our (Group 2) race time. The sun was peeking in and out occasionally - then just about 1 minute before the race, it came out pretty steady - HOT! We were grouped with DSR, FF and F5 so the Vee's were last. We talked the Chief Steward into letting the 2 F5's mixed in with us go ahead of all the Vees rather than have them (with the high HP to WT) easily outdrag us to the first turn. Pole sitting Oseth, lagged the Vees a bit so that we would have a clean start. GREEN!! I got a good jump and passed Oseth on the inside with Brad hanging tight on the outside as we came to T1 - Brad made it as tough as he could, but I had position and he dropped behind me into T1. The Vees come through T3 following the start. Things went well until we got to T6 - I didn't screw up, but that was where I 'hurt' the most since I had a taller 3rd gear than anyone else (one of the reasons I went - to see if I HAD to get another gear box). Brad was all over me as we climbed the hill and he passed me into the chicane. I held pace with him and kept Steve (Oseth) behind me - all pretty close. On the next lap, coming out of the same T6, Steve was all over me and able to make the pass going into the chicane (I think I now have my answer about the gearbox). I stayed close, but T6 was my nemesis each lap. The harder I tried, the worse it got. When the lead DSR and FF cars started coming through, I got put out and lost contact with the front 2. I could still see them and I was comfortably in front of 4th place, but I couldn't close the gap. As more and more cars lapped through, I dedicated my laps to learning the track better instead of catching Steve and Brad. I still had problems at T6, but practiced everywhere else as best I could. I kept the car out of the concrete and turned my best lap of the weekend while finishing a somewhat distant 3rd, but still comfortably ahead of 4th. All in all, a moderately successful weekend (would have been a REALLY GOOD weekend except for the concrete thing!). My take on HPT? Well - I don't see it as a "good" track for the Runoffs. There are only 2 places to pass and only one of them might be "clean" - the front straight and going into the chicane (after T7). That means that there will likely be a lot of crashing by cars diving in at places where passes just CAN'T be made - trying to make them anyway - and that means CRASH! (we'll see). It is a 'quite tight' and slow track with a LOT more elevation change than I expected. It's NOT FLAT!! :-). There are several turns that make it interesting and fun to drive - and a couple that even tend to "separate the men(women) from the boys(girls)". I found myself noticing 'fatigue' during the race - not really 'fatigue', but hands hurting, sweat pouring, and such ... things that I usually don't notice much until the race is over. It's an INTENSIVE track and a bit more challenging than I was led to believe. October will be interesting, to say the least. Roebling Double National ? - July - skipped!! Thankfully, the tow was uneventful and we made it to the track midday on Friday. We set up (I was alone - Linda had to work :-( ) and waited for Jerry. He arrived a couple of hours later and we unloaded, checked out the race car and then grilled some steaks and celebrated another race event together. Saturday morning dawned damp - not raining, but JUST sprinkling. As our group 2 went out, it was stopping, so the track was pretty dry on line, but still damp off line. The session went fine - we were careful, checked out the car (this was just practice) and deemed everything "peachy"! With the car needing nothing, we goofed off and chatted with the other Vee drivers while we waited for our qualifying session. At the start of the qualifying session, I went out and put in one 'decently fast' lap then slowed and started looking for another Vee to draft with. I saw a pack of 4 cars coming up on me and picked up speed as they closed. I went through the left hander at the top of the esses and then glanced in my mirror to see how close they were to me. BAD MISTAKE! I missed my turn-in coming into Oak Tree and got in the grey. I slid wide and off the track - into the "not quite dry" grass and then slammed the tire wall HARD - 40-50 MPH at least. I "stuck" there, but really didn't want to stay right in that impact zone. Corner workers were across the track and couldn't come to my aid immediately. I got the car cranked again and tried rocking the car fore and aft several times before finally clearing the wall. I eased forward and noticed that my left mirror was missing, but the front wheels were still attached and seemed straight and I was rolling, so the rear wheels must still be there as well. The impact was on the left side - I could see the right side in my mirror fine, but no view of the left without that mirror. I drove down a respectable distance in the dirt before easing back on the track - I swerved a few times and all felt OK. I watched the workers at the next 3 turn stations to see if they were waving the 'bad things' flag or motioning to me - nothing. I picked up speed and continued to test the car - steering? the wheel was positioned oddly but control seemed OK .. brakes? seemed OK ... tires? seemed OK ... engine? seemed OK. I stayed out and gradually picked up my pace ... working back up to full speed. The engine felt great and the car was handling great (considering the old tires I was wearing - oh, and that 'wall thing'). My speed on the back straight seemed even faster than before the impact! I clocked in a '21' (2:21) lap (pole time) and several low '22's before the end of the session. Back to the pits and a quick glance over the car and all looked good - except for the steering wheel position and the missing mirror. I went back up to Oak Tree to look for my missing mirror - no luck. When I returned to my paddock spot, Lee Wagner was there and asked if the left suspension pickup point was always broken like this? Ugghh! Alas, there WAS damage - and it was significant! Of the 2 attachment points of the left trailing arm, one was completely broken off and the other was bent badly. The axle tube and pickup mounts had to be replaced. I was VERY lucky that the last bolt had held during the laps I took - that could have been a really major crash had it come loose on a high speed part of the track. We got out parts and fixed the rear, then took the body off to look at the steering box. As I leaned in to look at things, I noticed the MIRROR lying in the bottom of the car! :-) - obviously, my lucky day !! The mount was broken, but otherwise intact. I fabricated a repair and reinstalled it. I sorted through my spare steering boxes and found one that seemed a good bit better and replaced it. We aligned the car in the dark and patted ourselves on the back for a completed repair job - car ready to go in the morning warmup. Warmup time came and I turned 3 laps - everything felt great. I didn't go fast, but decently. Just wanted to make sure that I wasn't blowing oil out of the just replaced rear axle tube some where. Now we clean up and pack everything possible while we wait for race time. I did notice that the replacement steering box was WAY better than the old one :-). RACE TIME! - On the pace lap I noticed that the throttle was sticking a bit - NOT a good thing to have at the end of the back straight!! I punched it SEVERAL times before it seemed to clear up - but I still worried about it. When we started down the back straight, everything seemed to be just fine. Coming to the start, we were all lined up pretty well - GREEN!! and I floored it. Mike got the jump on me, but I held position about a length back. As we closed on turn 1, I began to ease up on him (what's that noise??). By the time we reached the braking point, I was well along side Mike and had the inside position. I took the turn and led the Vee pack into T1. As I came up to full throttle coming out of the turn, I realized that "that noise" was my engine misfiring (ARGGHH!! :-( ). It was bucking and missing, but still seemed to have decent power - what could I do but continue till it quit ... into T2, then 3 and 4, up through the esses. Pumped the throttle a few times trying to clear it ... carb? ignition? can't tell for sure but it's still running and we're still in front. Sounds TERRIBLE, but pulling good. Mike closed up on me down the back straight - not close enough to pass. We came into 'hog pen' where I knew I had an advantage - and I did. Coming onto the front straight I pulled Mike by about 10 car lengths with the rest of the pack well behind him. That essentially ended the "race" - as long as the car kept running. I decided I needed to put as much distance as I could between Mike and myself in case I needed a cushion later on. I watched my lines and turn-in points and started dropping my lap times. The miss in the engine seemed to get a bit better, but was still quite noticeable. As mentioned above, my lap times hadn't been up to par till now, but as the race progressed, I got into true competitive times again. By the time the checker fell, I had turned several laps within 0.5 sec of my "usual" fast times at VIR (mid '19's) - even with the engine missing significantly. Following the race and impound, I tried to crank the car to go back to my paddock spot and the battery was DEAD!! Guess that might be the 'missing' problem .. huh?? :-). Have to do a bit more checking to be sure, but I'm confident that the battery was the cause of the engine misfire. I'm just glad it didn't get worse during the race! Clean up, replace the battery, replenish my spares, work on a few things and make plans for Topeka in October. Another division Championship for the Wedge Racing Team (12th time!). The tow out was long but otherwise uneventful - except for a 30-40 mph headwind for 7 hours on Thursday.... didn't do our MPG any good. We had been watching the long range weather forecast for the last 3 weeks or so, so we were WELL PREPARED for the expected HOT/MILD DRY weather. On arrival (midday Thursday), all looked pretty good. We got into our pit spot with no trouble, but then realized that the spot I'd reserved for Gordon's motorhome (#94) didn't actually exist (??). Only 93 spots were lined off for motorhomes. A brief discussion with the parking czars yielded some reasonable results from everyone and we were allocated another spot - since they had parked a chassis dyno about 20 feet from the original intended spot, I felt the new arrangements were in our best interest after all. We set up camp and unloaded the car, sorted through tires and generally got ready for test day. At this point, Linda and I were on our own, as the crew (faithful Jerry from Mid Ohio and *OLD* FV driver from the dark ages, Gordon Webster from Kingston, TN) wasn't expected to arrive until Monday morning at the earliest. Everything seemed ready, so we watched the 5 or 6 Vees testing on Thursday. The times seemed a bit quicker than we had seen in June - temps were in the high 80's under clear skies. Friday test day opened clear as expected but several degrees cooler than expected. I guess the most interesting aspect was trying to get into the car in almost TOTAL DARKNESS!! Our first session was due to begin at 7AM and the sun wasn't quite up over the horizon at the time. It was actually quite difficult getting into the car and strapping in ... guess we should have brought a flashlight . The session was delayed a bit while we waited for the corner stations to be able to SEE each other and all went well (I DIDN'T hit the wall again ), and we were immediately close to our best June times. Throughout the day, the temps rose until the last session and we stayed in the top 3 all day. We tried several different tire combinations, but could not seem to match the grip sustained by the fastest Hoosier shod cars.... but we were CLOSE . We wrapped up the day successfully (no contact with anything solid) and settled in to watch the next 2 days of testing. Quite a number of cars tested on Saturday and Sunday as the temps continued to drop, but Bob Neumeister ('Nuby') came into clear focus as the dominant car. Neither Steve Oseth nor Brad Stout - both strong cars from earlier - tested on Sunday, but Nuby stood out easily - HE was the one to watch. As the sessions progressed, it became clear that Nuby's dominance was - at least somewhat - related to his Hoosier vs Goodyear tires. Hoosier had brought a new compound that seemed to agree with the specific type of asphalt used to pave this new Runoffs track. We were next to last group out on Monday, so had plenty of time to make sure all was well - problem was, the temps continued to drop all day, and the sky was overcast. All our "warm and clear" weather forecasts were out the window. On Monday and the temps continued to drop. Mostly overcast, but no real rain threat. Nuby jumped to the front again with Oseth in strong pursuit. The guys on Hoosiers were clearly setting the pace - the Goodyear tires just didn't like this surface when cold, and we couldn't get the grip that we needed to control scrub (loss of speed). We were "decent" and finished the session in 8th spot. Brad managed to get 6th, a couple of tenths ahead of us. We went early on Tuesday and rain was threatening - and it was getting colder - now into the low 50's with buffeting winds that chilled you to the bone. We decided to try the 'tall' tire combination to see if the additional contact patch in the rear would grab the track better. The car seemed a tad better, but ultimately still had the same problem - and the tall tire hurt us coming out of the tight turns and on the critical uphill Turn 6 leading to the back chicane. We did manage to go over a second faster, but only held our grid spot as most everyone else also went faster. Mr. Oseth managed to nip Nuby for the pole this time (by .048 secs). We finally got within 1.1 secs of the pole time, but it was clear that the tall tire was hurting us from a 'race' perspective. It would be too easy for cars to pass us going into the chicane without having the additional gearing of the short tires. One small surprise was Lisa Noble as she jumped well past us up to 4th spot on the grid - nice job Lisa! The temperature continued to drop and the rain threat became more evident on Wednesday. We went in late afternoon (it got later as the sessions ran long), but the skies never dropped moisture ... that is UNTIL the 1 minute sounded for our session. As we left the grid (everyone on slicks, of course), the mist turned into a light drizzle - then into a "real" drizzle and finally into a light rain. I stayed out for 2 laps - although I was managing to hang onto the car, I was fearful that someone else might do something I didn't like and crash into me. I chugged back to our paddock spot and got out. We stood there talking about the track conditions for about 5 minutes and then I suddenly realized that I was hearing Vees "at speed" and noted that the rain had stopped and the cars seemed to actually be moving pretty well out there on the track. I checked the clock and realized that by the time I got back in the car and got to the grid, I would be VERY lucky to get out onto the track before the checker flew for our session - so I bagged it and went and watched. Most cars were going respectably fast, but no "fast" times were being set. The only grid changes would be at the back of the field. I spent quite some time at the Goodyear camp discussing possible options for tires. Finally, I remembered that there was another tire compound that I had not tried. The 475 compound, developed several years ago (that I didn't like on a hot, dry track), MIGHT just work on this strange surface. Eric (my Goodyear guy from Comptire South) had some shipped from his shop so we could try them on the last qualifying day. We went out just after lunch on Thursday - a warmer part of the day, but the temps kept getting lower and lower and the wind kept getting stronger and stronger. We were still looking at low 50's, even at this time of day. The new tire compound (only available in the tall tire size unfortunately) , was worse rather than better. I didn't go any faster and also got passed by someone who did - I dropped to 9th on the grid. We went to look over the forecasts for the weekend weather L. The forecast was for slightly warmer temperatures, but now called for RAIN on Sunday - that could be good for us. I had a new set of rain tires mounted since I knew the ones I had were too old to be any good in these colder temps ... and then we waited and watched races for a couple of days. Sunday morning it was RAINING!! We were the 4th group out for the warmups and the new tires seemed to work pretty well. By our clock, we were the fastest car on the track and Brad (closest Goodyear competitor) was second. Things were looking up J. Unfortunately, it wasn't to be as the rains stopped shortly after our warmup and the sky lightened noticeably. Our race was first after lunch and by that time the track was completely dry - at least on the racing line. We bolted on the short rears and got ready to go. Cutting corners at the apexes (into the MUD) would be a definite NO NO so care was of the utmost. We made the grid with less than 2 minutes to go (they MUST be starting early!! ), but in time, so no real problems. The skies were still overcast and rain could start at any time - but everyone was on dry tires, so we'd all be in it together, whatever might happen. All races had 2 pace laps for this event - I guess due to the unexpected cold temperatures. As we came out to get the green, I got a little close to the car in front of me and (wouldn't you know it) JUST as I backed off, the green flew - I was caught 'napping' as they say. I guess I lost about 3 spots going to turn 1, but a big melee broke out in front of me - I dodged cars - no spins that I saw, but cars were going everywhere - someone MUST have spun - just not sure who (whom?). I dive inside T2 when a small opening appears and when I come out, I see 1st, 2nd, 3rd going into the carousel (T3) and - strangely enough ... only .. TWO? other cars in between them and me (ok, MYSELF, oohh MYSELF and THEM - this is NOT a grammar lesson - I'm RACING !!) ! I'm in 6th spot - but not for long. T3 is one of the places where the Hoosier tires are KILLING the Goodyears and I lose 2 more spots right back. The good news? I get them back again on the next lap as I pass Roger (Siebenaler) for position on the front straight and Mike Varacins spins out of 2nd place somewhere. On the next lap I think, I get ahead of Jeff (Loughead) as we pass the timing line, but he is in position for a better draft into T1 and takes it back going in. A nice cool off lap and it feels GOOD to get directed once more into the impound area (hope we pass!). Hop out and shake hands all around - ROGER pulls up behind me. He was still there, just some "confrontation" between he and Nelson that slowed him down a bit (that's between THEM J ). I go watch a couple minutes of the victory celebration and congratulate all. Great job NUBY! Then on to the impound area and teardown for the winner. (this is where it gets bad). Some 5 hours later, they are still working on Nuby's teardown - seems there is some problem with his heads and they keep redoing the tests to give him every benefit of any doubt. Finally, he is declared illegal via CSA (Chief Steward's Action) and Nuby goes off to file an appeal as they begin to tear down the 'next in line' - Steve Oseth (and still we WAIT in impound - will they get to me? Not very likely that the first 4 would all be declared illegal, but still I have to wait.). Steve, is finally cleared as "good" and we are released from impound - regardless of the outcome of the appeal, SCCA now has a National Champ for FV! Finally, around 10:30P, Nuby has lost his appeal and has been DQ'd from the event - the new Champ is crowned as Steve Oseth - AND we move up to 4th spot. I have to say I'd rather finish 5th and have Nuby retain his position, but the rules are the rules. At least, this time, there doesn't seem to be any question about it. Nuby and Ron Chuck (the guy that ported the heads) apparently felt that they had found a loophole in the rules and would be legal with the heads they ran - SCCA did NOT agree. It's a shame as Nuby obviously had a great drive to the checker. Our tow home (departure delayed by EIGHT HOURS!) was about the worst trip I've ever made from a driving standpoint. The rains started just before the last race of the day (Formula Atlantic, no less) on Sunday and continued ALL THE WAY HOME and for TWO MORE DAYS after we got here. The winds were BRUTAL for over 9 hours. It was all I could do to keep the motorhome/trailer combination in no more than 2 lanes. Despite that, we had an uneventful trip and made it home safely. Thanks to all for their words of support and especially to Gordon and Jerry who drove all the way to Kansas - not JUST to see 'Toto', but to help us in any way they could. Thanks for another good year also, to Rollin Butler, my engine builder (ButlerEngines) and the Goodyear Racing team that shows up at virtually EVERY event to make sure that the racers have the support they need and to JR Russell, of Roxannes Headers - he builds the best system out there. One GLARING OMISSION from the event was that "n'er do well" - MIKE PINNEY (a TWO TIME *FORMER* National Champ - albeit NOT in FV) - although he assured me he would be there to visit and watch, he never showed (or did so skulkingly). I hope something bad hasn't happened to him. I'll be watching "Ten Most Wanted" to see if his likeness shows up <G>. Another MIA 'set' (Pinney is a 'subset' as is Jerry) was the Mid Ohio Esses Gang - only Jerry made the trip out. Hope all of you get to see the Video when it shows up on Speed. Current schedule has us set for air time of 3P (EST) on Dec 12. For a full schedule of airings, go to SCCAonSPEED. Some down time - some golf, tennis and snow skiing are on the calendar. Who knows, I might even have to do some WORK now and again :-).